Are you hoping to lose weight and keep it off, without resorting to dangerous weight loss practices? Not sure about how to accomplish your aims? Here are four things that you can try to do every day in order to achieve some incredible results. There are a lot of great reasons to consume plenty of water every day. First off, drinking enough water will ensure that your body remains hydrated at all times, and that can help every organ system can function at its best. Beyond that, though, drinking water can also help you lose weight and keep it off because it can help fill your belly so that you won’t feel so hungry all the time. Drinking some water before you sit down to have a meal can also help you control your portions and calorie intake more easily because you’ll feel fuller from the start. Furthermore, by drinking pure water, rather than sugary drinks or alcohol, you can also ensure that you’re hydrating your body without ingesting additional calories. When it comes to losing weight and maintaining your results, measuring and tracking your foods is important. Doing so can help you control the number of calories that you eat every day, and it can also help you when it comes to consuming the appropriate portions. Plus, keeping track of the quality of the foods that you eat can also help you stay on course if you’re trying your best to avoid unhealthy options. Without tracking what you eat, it can be easy to go off your healthy path. Just 30 minutes of cardio every day, or at least several times per week, is yet another way to lose weight and keep it off because it will help get your heart rate and your metabolism revving. That translates to more fat and calorie burning. So, in addition to lifting weights to build strength, it’s important to incorporate some cardio into your workout routine as well. 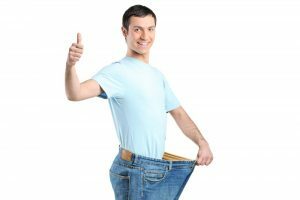 Finally, to lose weight and keep it off, you should do your best to stay focused on the health benefits that you can derive from the process. Maintaining a positive attitude will help you keep your motivation high, and that’s important because it low motivation may make you take the easy way out. Knowing that you’re taking steps to improve not only your waistline, but also your overall health, will help you stay on track and get great results. These weight loss tools from Weight-Loss-Center.net can help you keep your eye on the prize.